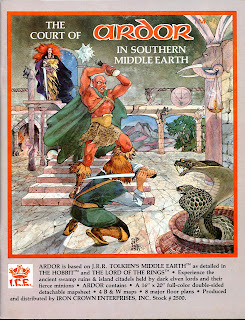 More than any other ICE module, The Court of Ardor had a profound impact on my imagination. From page one I was living southern Middle-Earth in daily fantasies -- riding the Mumakani elephants, taking in the republic of Korlan, having passionate love affairs with elves as evil as drow. One thing was clear to me at the time: this sort of thing would never be repeated. The gazeteer displays regions as rich as anything Tolkien ever developed: savage Mumakan, democratic Korononde, imperial Tanturak, reckless Hathor, aloof Taaliraan. All of which would be more than enough, but this entire sandbox is used as a platform for a quest, where the stakes are as high as in The Lord of the Rings: a group of evil Noldor have been trying to destroy the sun and moon since the First Age, and now, in TA 1703, are ready to enact a ritual that will do exactly that; a group of PCs must band together and prevent the ritual, and also ensure that the ringleader of this evil court, Lady Ardana, is killed by the son Morgoth fathered on her. The ritual that will bring about eternal darkness is the stuff of gonzo pulp fantasy, but it also mines some of Tolkien's best myths. "On that dark day when Ungoliant and Morgoth destroyed the Two Trees, and Ungoliant had consumed all of the gems of Feanor she later belched forth many -- but they were changed. Instead of the radiant crystals of light they had been, they were dark, in fact they consumed light; they were of unlight. The eight largest of these (each about the size of a clenched fist) Morgoth gave for his cause, and Morthaur conceived a plan: a design which would focus the light-consuming powers of the eight gems in one great burst to drain both sun and moon of light. But the sacrifice of one of the blood of the Valar would be necessary to trigger the gems. Ardana would bear a daughter fathered by Morgoth." It turns out, however, that Ardana had not only one child from Morgoth, but twins, and the boy was stolen and raised in secret by a guild determined to bring down the Court; he is "fated" to kill Ardana (much like Eowyn was the Witch-King), and the PCs must protect him at all costs. 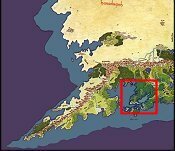 The mission to save Middle-Earth -- to keep the sun and moon alive, to destroy the gems of unlight, to procure the death of an elven lady who will keep resurrecting the same diabolical plot as long as she goes on living -- is the module's focus, making The Court of Ardor unique. There are always suggested adventures at the end of ICE's campaign products, but here it's a single epic quest, and it interprets the sandbox rather than the other way around. The Court members are some of the most colorful NPCs I've seen in any gaming product, two of them actual demons, and I like the recurring theme of repentant male twins versus their evil sisters. Ardana's children have already been mentioned, and there are also the two Featurs -- the female member of the Court, and her brother whom most believe dead, but is working against the Court from behind shadows, perhaps even with the PCs. It's worth mentioning the Ardan Decks of Cards. Each Court member owns a pack, which consists of 21 special cards on top of the usual 52. The decks have quite a few magical side-benefits, but are primarily used by the High Lords to communicate with each other far away. The special cards bear the images of the Court members (plus some "dummy" celestial images), and when wishing to speak to a colleague, one focuses on the card with the appropriate image. The male Featur, however, has managed to sabotage the decks by implanting his own image on one of the "dummy" cards which sometimes resembles a mirror, other times showing the same image of his sister's card (the female Featur) -- which allows him to spy on the Court members both ways. The decks can be put to extraordinarily good use, but are also quite perilous in careless hands. I can't stress enough how effected I was by this module when I first read it. The Mumakan region is so inspired, and while its cultures lie outside the Tolkien canon, they feel not in the least bit forced or contrived. And what's brilliant about the quest is how pliable it is. 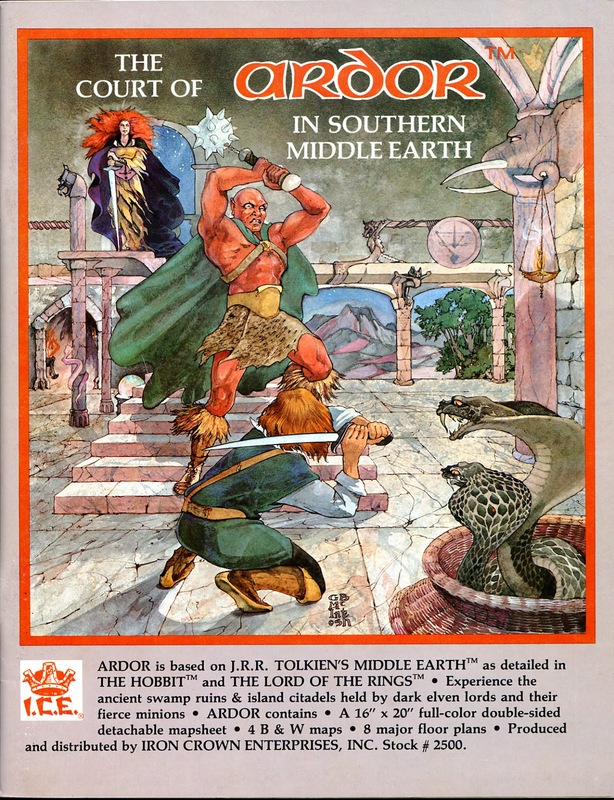 The very year Ardor was published (1983), Dungeons & Dragons was taking its first steps out of the Golden Age and into the dreaded Silver, where modules began railroading PCs into pre-packaged narratives and foreordained outcomes. Ardor doesn't do that. It lays down the framework, but nothing beyond bare-bones essentials. For instance, the eight strongholds of the High Lords could be necessary stopping points for the PCs, or some of them could, or they could all be irrelevant and just bypassed. If they are used, it's a splendid excuse for touring 340 x 440 square-miles of Southern Middle-Earth and tasting exotic cultures. PCs can visit Middle-Earth's only republic (Korononde), get involved in the lethal politics of Tanturak (whose emperor is an unwitting puppet of the Court of Ardor), mix with the insular elves of Taaliraan, or land in major trouble with the barbaric hordes of Mumakan. The fact is, this module can be used like any of ICE's campaigns, with or without regard for the suggested adventure; DMs can set up camp and get loads and loads of mileage. Last up: Shadow in the South.